The vote will be considered valid if there is a min of 3% POI voting of ‘YES’ votes only. There must be a 65% majority of ‘YES’ votes for the vote to be considered successful. The vote will begin for 5 days starting on 15 February 6:00PM CST and ending at 20 February 6:00PM CST. You cannot vote until 15 February 6:00PM CST. All community members can vote via the NEM Wallet. You can vote through the NEM Wallet. A the main landing page of the NEM Wallet, go to the upper left navigation bar where it says “SERVICES”. Click on this and then scroll below to the service called “VOTING”. You will see a link called “SEE POLLS”. Our poll will be in the "Official" tab. A voting guide can be found here. There is also a video guide on how to vote as contributed by community members @Stinghe_Dorian here and @LauraBKK here (obtained with permission). We are thankful for all contributions from the community. The funds drawn will likely be from the NEM sustainable ecosystem fund and marketing fund. Total list of funds here. If the funding request is approved, NEM Foundation will restructure to have newly created product-focused teams. The heads of these teams are Chief Technology Officer, Chief of Product Management, Chief Financial Officer, Chief Business Development Officer, Chief Operations Officer, Chief Marketing Officer, and Chief Revenue Officer. The ExCo and Council will provide the governance layer and we become accountable to the community. Each of these team leads will be responsible for reporting metrics and delivering a Return of Investment (ROI) directly to the community and council to maintain transparency and accountability. All funds spent will flow through the head of finance and adhere to consistent accounting standards. NEM Foundation has been overseeing a form of organized marketing and business development which will be a key need to the launch of Catapult - there are plans to promote Catapult through a comprehensive digital marketing strategy and following up on key strategic relationships which have been established. The new leadership team has in place since 1 January 2019 only and we are committed to working with transparency and accountability. Alex Tinsman, the elected President had the highest votes for both POI and registered members votes. We are adding an aggressive set of goals for tech product features, developer tools, and programmers that will help make the NEM platform the best in the industry. We are also adding plans to be sustainable by being revenue-driven through the appointment of a Chief Revenue Officer. We are proposing a budget with a burn rate reduced by about 60% from its previous level. This will allow the Foundation to deliver ambitious results with responsible use of reserves. A lot of thought and reflection was put forth reviewing the 2018 Foundation’s failures and successes as well as understanding the general landscape of how other similar successful organizations are structured - having this funding request approved would mean that we can utilize to ensure we allocate resources appropriately. 1.) Expect to see more enterprise adoption utilizing Catapult with a revenue-driven culture. We want to be clear that NEM Foundation operates as a separate entity and is one of many ecosystem contributors to the NEM open-source project. Therefore the NEM Foundation is not NEM. The NEM open source project remains strong and thriving. Throughout the process of the 10-day discussion, we have received invaluable feedback and will strive to serve the community through this journey. 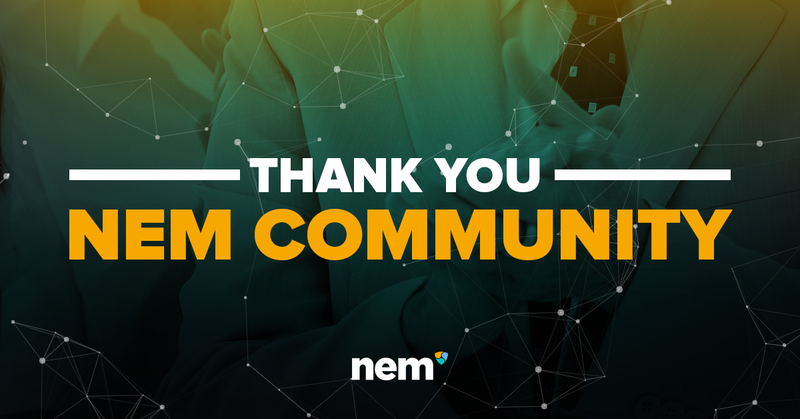 We have also seen a proposal for NEM Labs and NEM Foundation is in full support with their proposal as we encourage as many contributors to the NEM ecosystem. 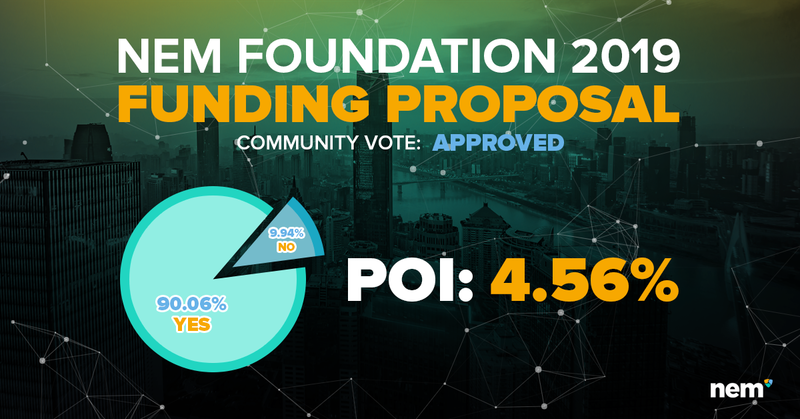 NEM Labs will be having a POI vote too and we will look forward to engaging with the community to vote for both proposals and make the best decision for the future of NEM Foundation. I believe every community member has the right to their opinion on who to vote and how to vote and we have to respect this. What I can say is that we have put our best foot forward and we want to leave it to the hands of the community to decide. The timing is more critical than ever. The community’s vote will also determine whether we have more support for the development of Catapult. 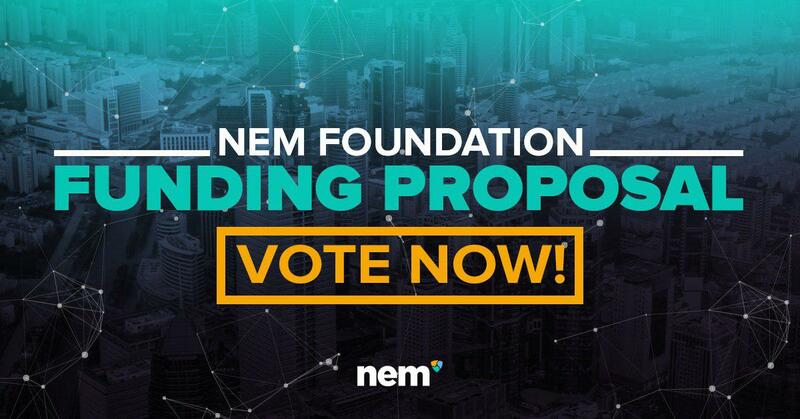 By voting YES for both NEM Labs and NEM Foundation, expect to see the first priority as channelling resources to support to Catapult’s launch. There could be literally be an army of devs and funding that will go to projects and partners to develop Catapult. We will be doing a disservice to the community, the world and ourselves if we screw up the entire year of funding to non-priority matters. It will not happen on my watch as part of the Executive Committee. Nor on Alex, our President, the council, or the NEM Labs leadership. Do take note of this. 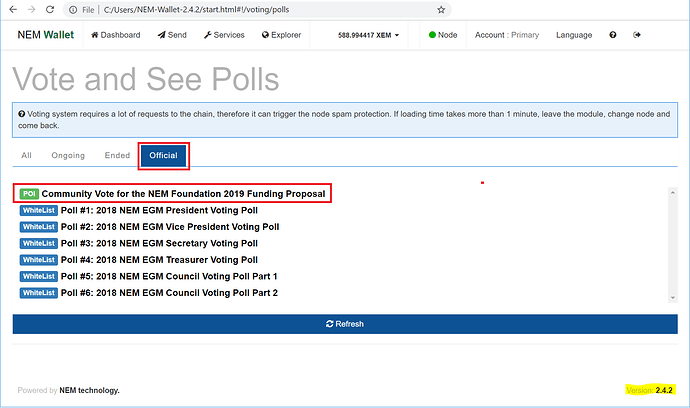 15 February 6:00PM CST is when the voting will be open for both NEM Foundation and NEM Labs, both parties agreed to support each other and stand united, and we hope the community does so as well. Thanks! Voting will run for 5 days from 16 February 2019, 00:00 until 21 February 2019, 00:00 . This is to confirm that both votes will happen at the same time to make voting easy vor NEMbers! NEM Labs and NEM Foundation are supportive of each other and are looking forward to pushing Catapult through a unified approach! Let’s rock this voting and (if I understood right) get devs’ approval for 2019 funding and then - achieve great together! LuxTag supports you - and myself too. Thanks @r3n3, appreciate the continuous support! 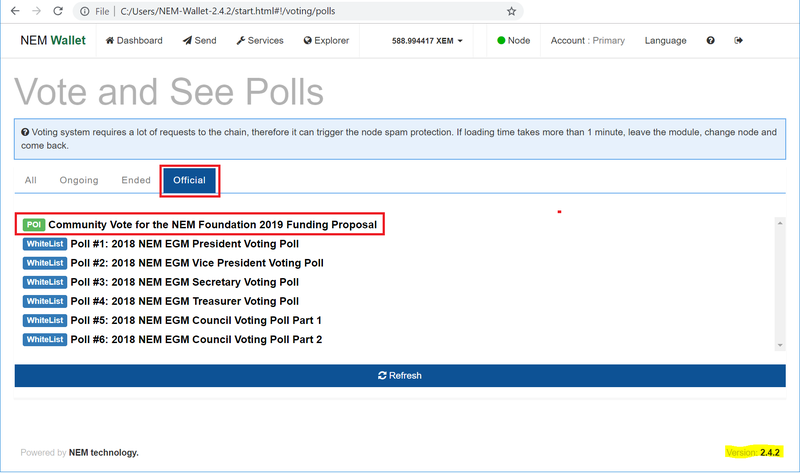 You can use the voting module in the NEM wallet v2.4.2 at https://nem.io/downloads/ or you can vote manually by following the instructions below. The vote is POI based and runs until 20 February 2019, 6:00PM CST / 21 February 2019, 12:00AM UTC. What do you mean by that @eddy @jason.lee ? Look at the results and you’ll see hundreds of pontificator votes. It does not matter. Both NF and LABS proposals got a massive Yes. Time to move on from the past, look to the future and put NEM on the top! Yes, thing won’t be final until the end of the vote date but let us keep our fingers crossed! Where can we see the results, voting polls are not clickable anymore in my wallet after voting. You have a link? Good news, we have met the minimum requirement for the votes! Thanks everyone for your feedback and comments. The work begins now.